Here are some great accommodation deals for Cooma Big Weekend of Busking, 3 -4 November 2018. 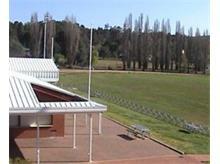 Cooma Showground will be available for camping for the Friday 2nd, Saturday 3rd& Sunday 4th November 2018. 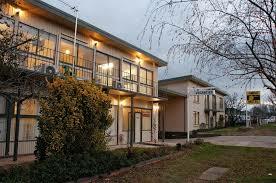 $15.50 per night for an unpowered site. This entry was posted in Australian National Busking Championships™ and tagged Accommodation on September 25, 2018 by allan. A celebration of Spanish repertoire for the guitar and piano, from classical masterpieces to flamenco styles of Paco De Lucia and Paco Pena and modern jazz. 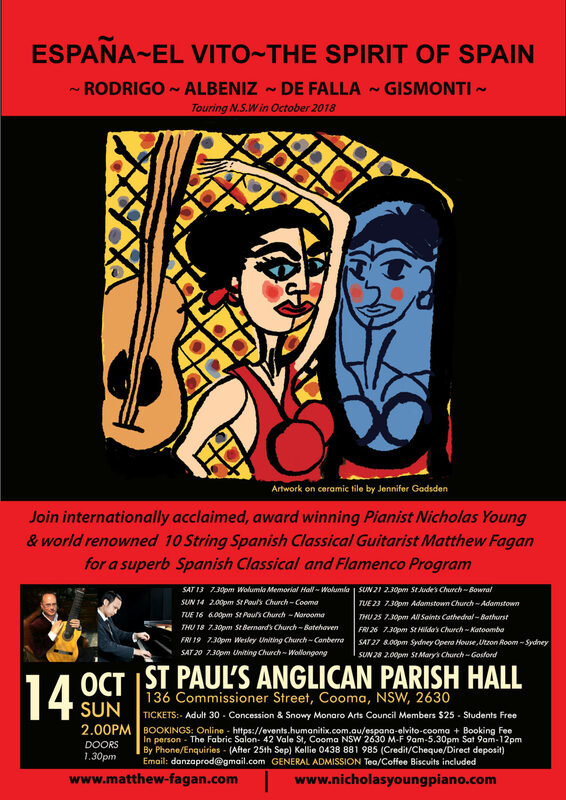 In a world first collaboration, Internationally acclaimed, award winning concert pianist and ‘Young Steinway Artist’ Nicholas Young and renowned 10 String Spanish Classical Guitarist Matthew Fagan aka Lord of the Strings! infuse the exhilarating traditional flamenco elements of Spanish Guitar into virtuosic classical piano masterpieces to form stunning new arrangements, celebrating the launch of Fagan’s newest vinyl album “El Vito”. From the famous folk-inspired ballet music of Manuel De Falla’s “The Three Cornered Hat” to the Spanish dances evoked in Isaac Albeniz’s “Sevilla”, “Asturias” and “Tango”. Joaquin Rodrigo’s famous “Concierto de Aranjuez” is explored through its origins in “Tarantos” and “Rodena”, combined with stunning orchestral realisation by piano, and Egberto Gismonti’s “Frevo Rasgado”, first brought to fame by guitarists Paco De Lucia and John McLaughlin, will be transformed for concert piano and 10-string guitar, pairing rhythmic drive with colourful sonority. This entry was posted in Concerts & Events on September 16, 2018 by allan. This entry was posted in Australian National Busking Championships™ on September 10, 2018 by allan. 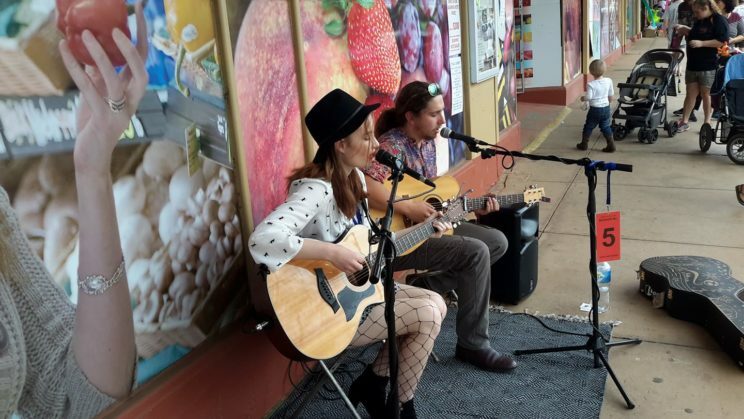 Cooma’s Big Weekend of Busking! The Australian National Busking Championships™ in Cooma this year will now be a two-day Busking Festival. 3rd & 4th November 2018. 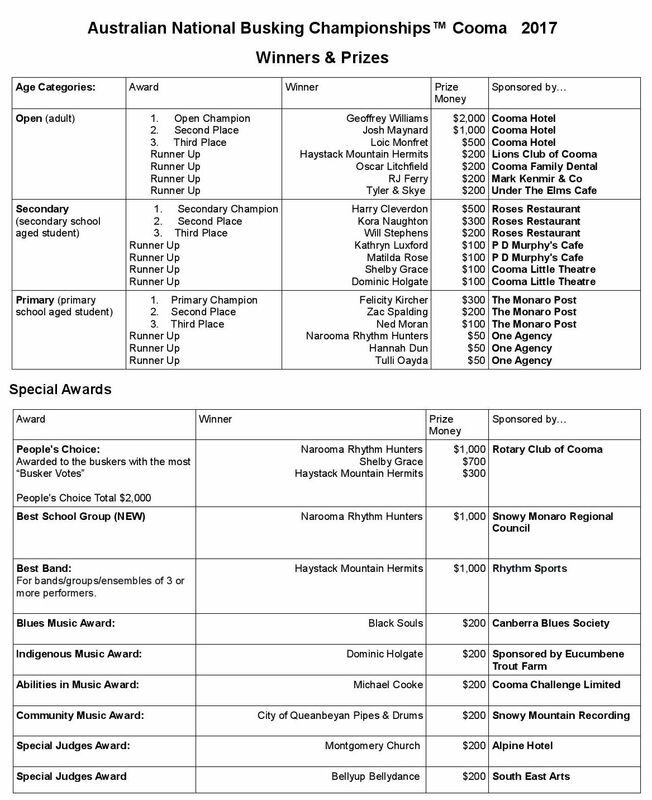 The ANBC Cooma Regional Busking Championships will basically have the same format as in previous years, with busking performances timetabled during the day on Saturday and then the Finals Concert in the afternoon. There will be, once again, generous cash prizes awarded, with three age categories (Open Adult, Secondary and Primary School Age), Best Band, Best School Group, Blues Music Award, Special Judges Awards and of course the hugely popular Peoples Choice Awards. 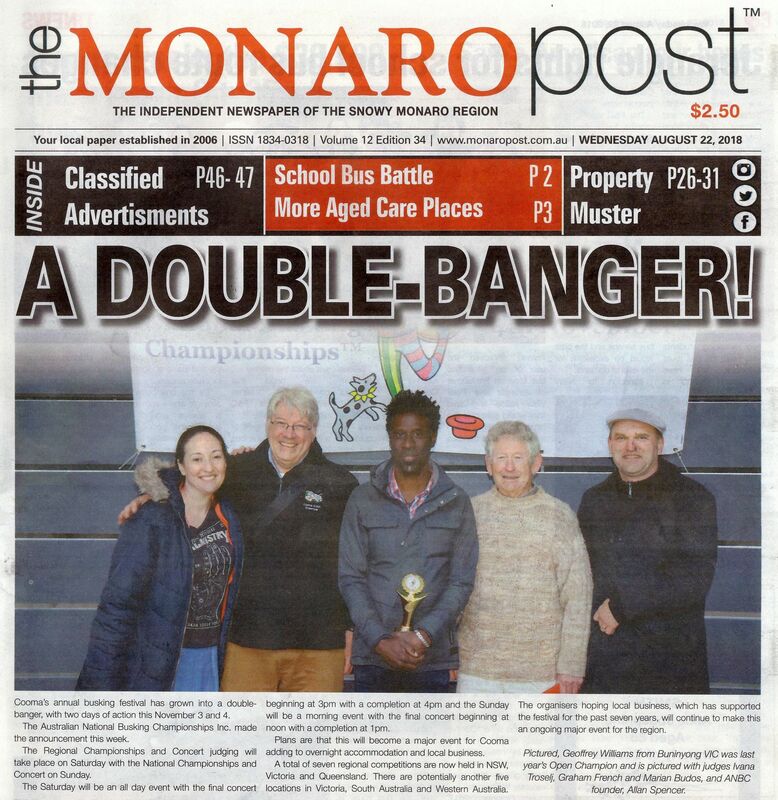 The First Place Getters in each of the age categories in the Cooma Regional Finals on Saturday will be invited back for Sunday to compete in the ANBC National Grand Final. 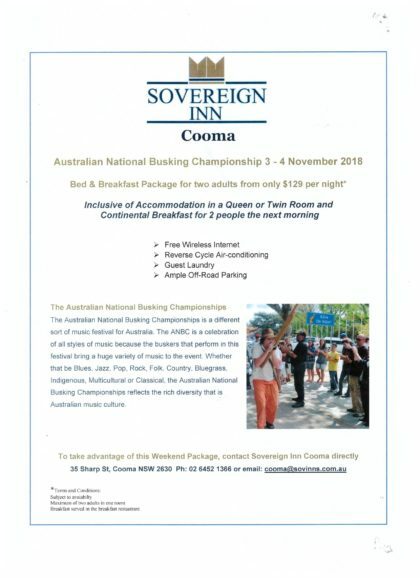 The ANBC National Grand Final will now have its own day in Cooma. 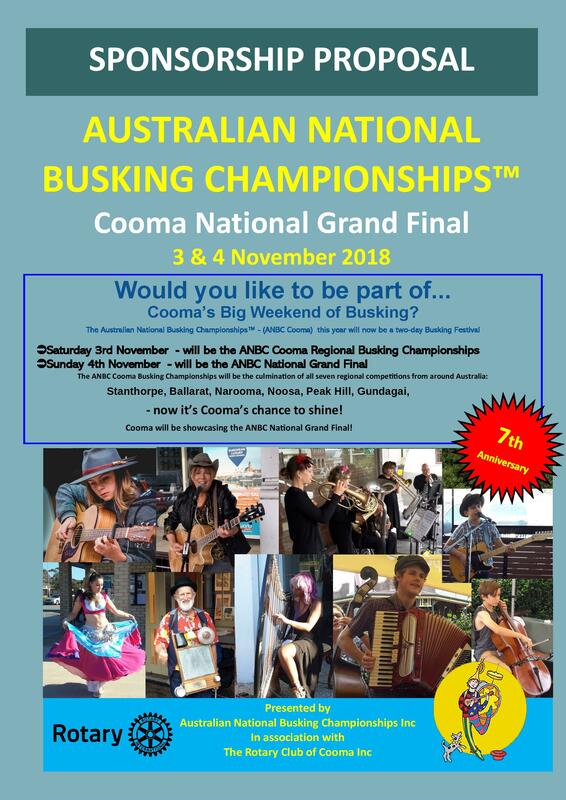 First Place Getters from all the seven 2018 ANBC Regional Championships in Stanthorpe, Ballarat, Narooma, Noosa, Peak Hill, Gundagai, and Cooma will be invited to busk on Sunday morning. Nine competitors, three from each age categories, will then be selected to perform for prizes in the National Grand Final Concert to be held at 1:00 pm. All the competitors that have qualified to busk on Sunday will receive a cash prize. 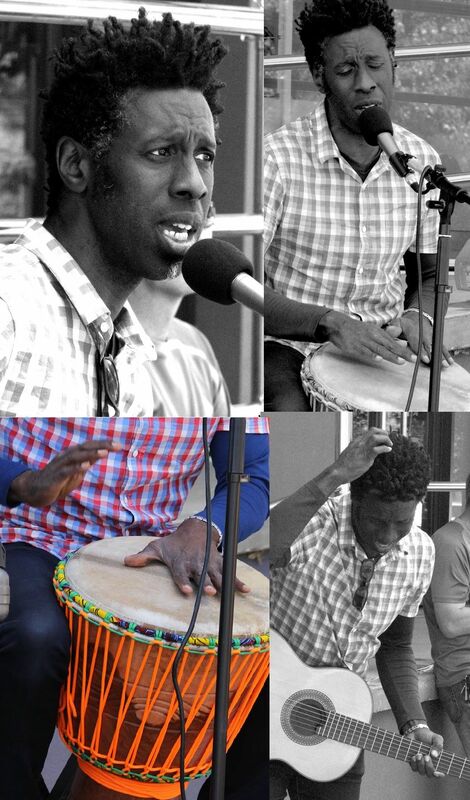 Buskers that have qualified for Sunday are welcome to also busk on Saturday. They can receive cash tips, sell CDs and merchandise, however as they will be guaranteed a share of the prizes on Sunday, they will not be able to win extra prizes on Saturday. We at ANBC are very excited about this year’s expanded program and we hope that the buskers, their supporters and the general public have a fantastic weekend in beautiful Cooma. More activities, such as Open Mic Sessions and Concerts are also in the planning stage. We’ll keep you posted. This entry was posted in Australian National Busking Championships™ and tagged ANBC Cooma, ANBC Regional on August 24, 2018 by allan. 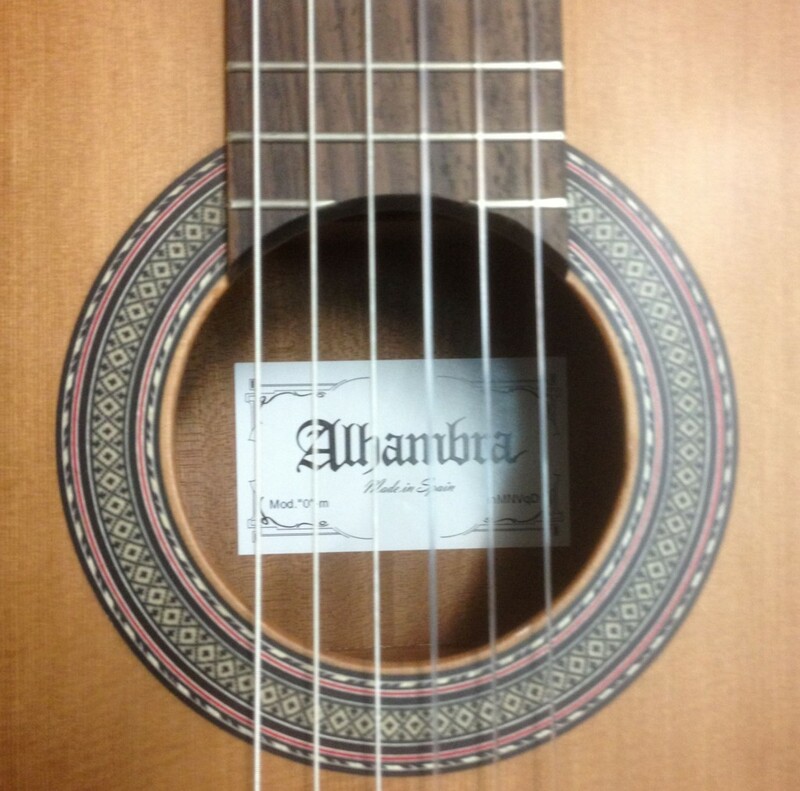 New Alhambra Classical Guitar with Pickup & Cutaway! 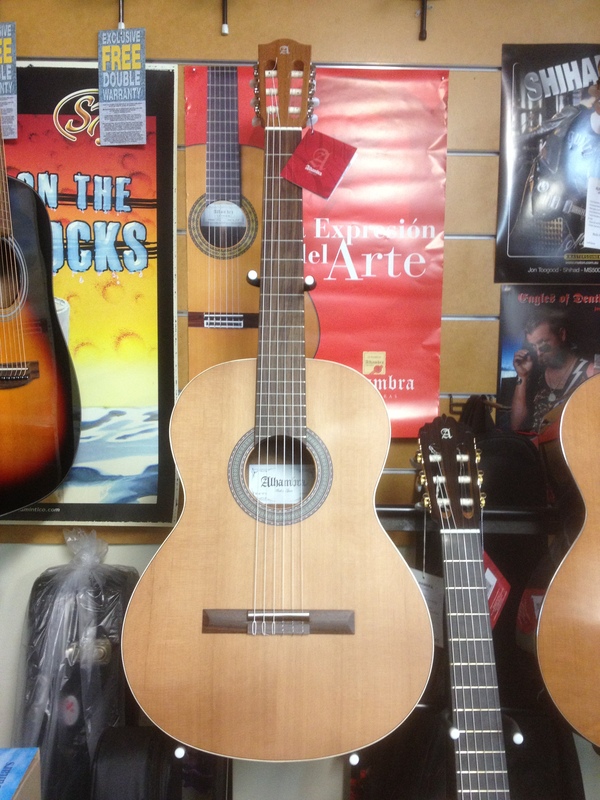 The Alhambra Z natural classical guitar now has a big brother just arrived from Spain! 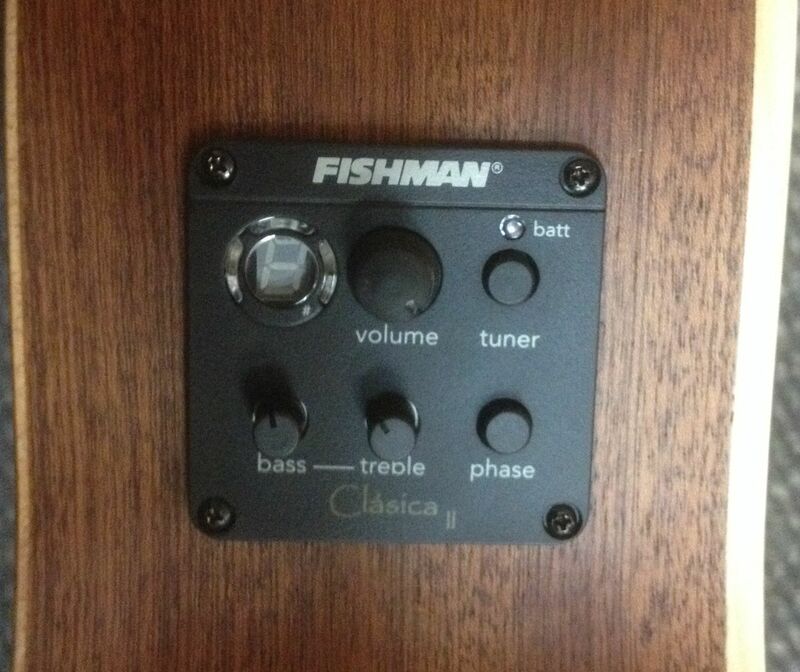 is basically, the Z model with an onboard Fishman Pickup & Preamp and a Cut-Away. Big acoustic sound and ready for weddings, parties..anything where more volume is needed. This entry was posted in Alhambra Guitars, Shop and tagged alhambra on December 1, 2017 by allan. Click here to see and hear these lovely guitars. 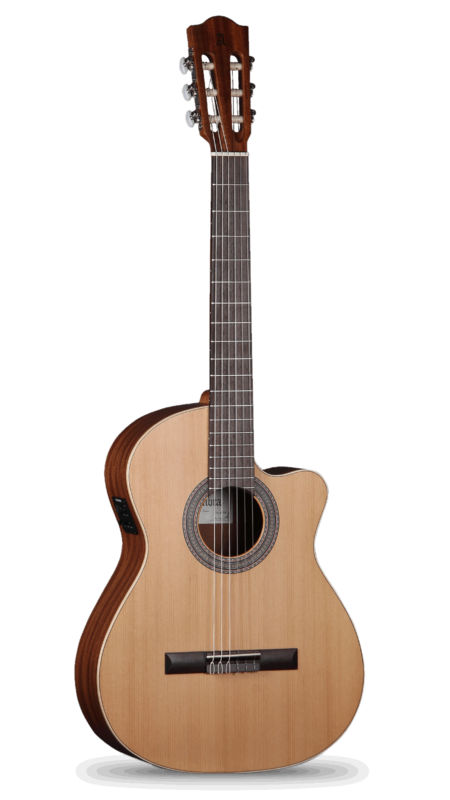 Alhambra 1C (Solid Cedar Top) $699-Great guitar for the serious beginner! This entry was posted in Alhambra Guitars, Classical Guitars and tagged alhambra, made in spain on December 1, 2017 by allan. 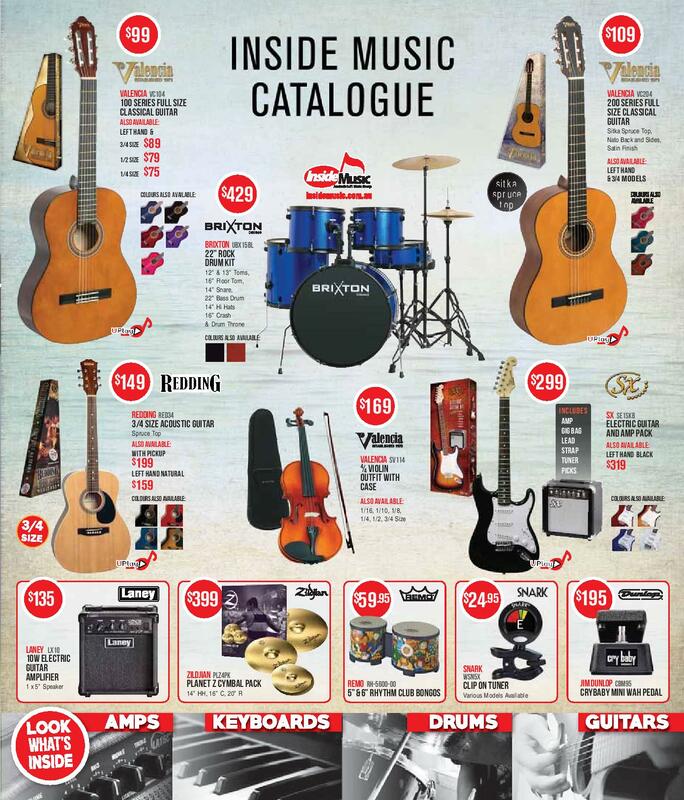 This entry was posted in Shop and tagged Inside Music on November 29, 2017 by allan. 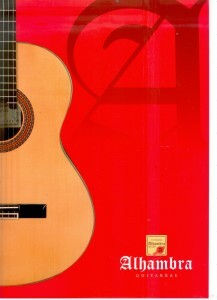 The luthiers at the premier Spanish guitar making workshop, Alhambra, website have just come out with a new student model classical guitar, the model zero. 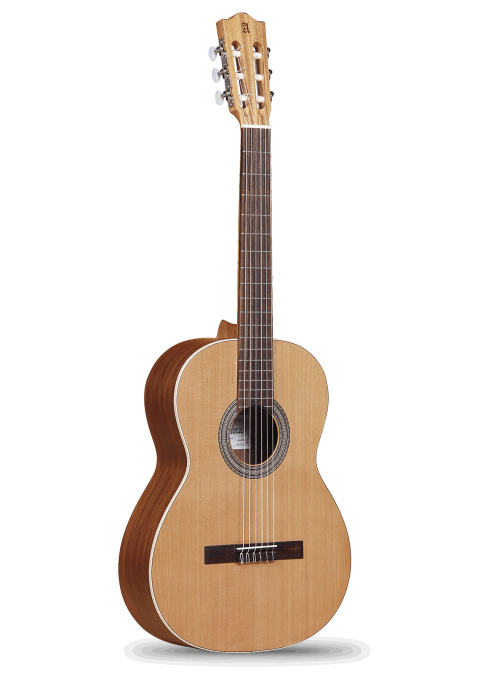 This is a lovely matte finished full-sized classical guitar with a solid cedar top. It retails for the amazing price of just $499! 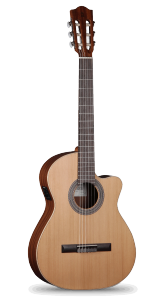 The previous entry point guitar in the Alhambra range was its glossy brother, the model 1C which retails for $699. That’s $200 more than the new model zero. This new model zero is an amazing guitar for the price. It has a beautiful solid cedar top which gives it a full deep rich bass and a warm sustaining treble, plus there’s heaps of volume. How can they do it for the price? Maybe they saved on the no-frills matte finish. Probably, but what a guitar! Made in Spain for $499. This is really going to upset the Chinese. 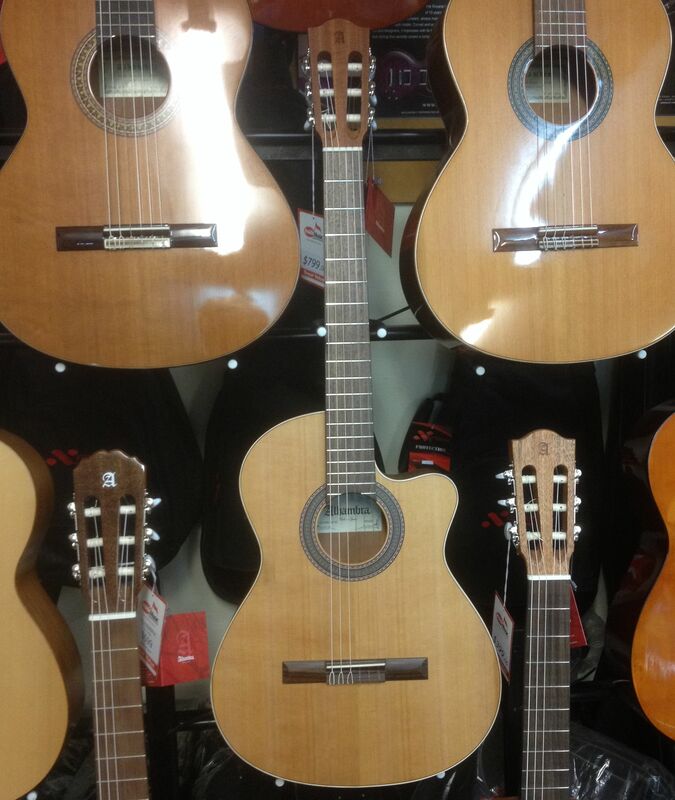 The Spanish guitar makers are fighting back! This entry was posted in Alhambra Guitars, Classical Guitars and tagged Alhambra Guitars on November 1, 2017 by allan.